Jesus soon saw a huge crowd of people coming to look for him. Turning to Philip, he asked, "Where can we buy bread to feed all these people?" He was testing Philip, for he already knew what he was going to do. 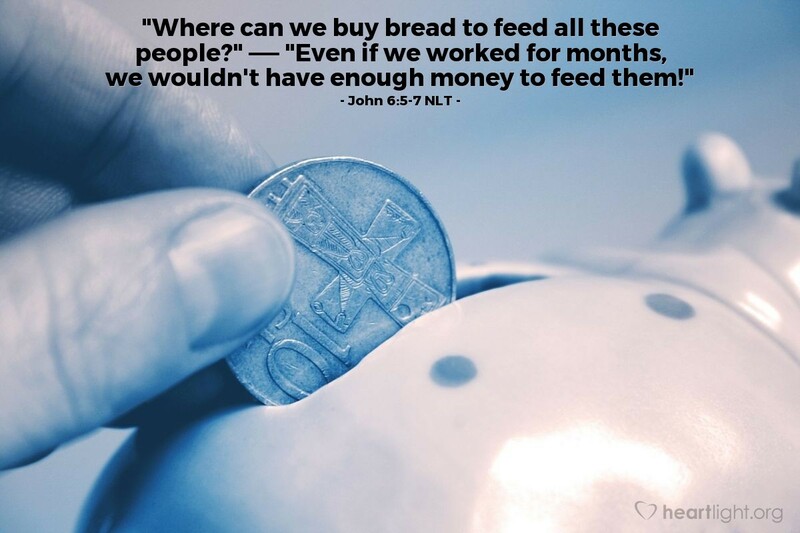 Philip replied, "Even if we worked for months, we wouldn't have enough money to feed them!" "Be careful what you pray for; you just may get it!" My experience with major outreach efforts of churches has been mixed. Some of them have gone bust — much prayer, planning, and effort with not much visible result. Others have seen such overwhelming and unanticipated response that we were left scrambling to handle all the "opportunities" that God placed upon us. Let's confess something about our plans to do great things for God: God already knows what he is going to do. The issue isn't God; it's our faithfulness. God can and will make us more than we are for special times of ministry and mission. That's not only his promise to us; it's his track record through the centuries. So when presented with great opportunities, let's not resort to the greatest killer of all: "We can't." Instead, let's go to God and pray fervently for his guidance, our faith, and our willingness to work for his glory. Father, you are God who is able to do far more than I can even dream. However, I confess that my abilities to execute challenging plans and see beyond my own limitations can make me hesitant to seize the great opportunities you place before me. Give me a clearer and broader vision of your will, your work, and your power. Give me a more willing heart to work hard and dream larger dreams. Do your work through me and surprise me with the results. In Jesus' name. Amen.